I’m interrupting my usual home decor posts for a recipe today. To be honest with you, I really do not enjoy cooking. When I find a recipe that’s quick and easy to make as well as one that everyone likes, I think it’s worth sharing. 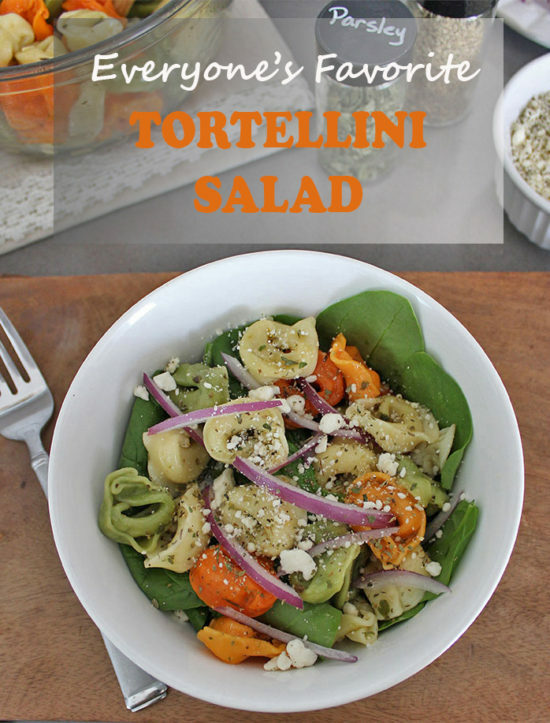 This tortellini salad also makes a great side dish for parties, it can feed a crowd. 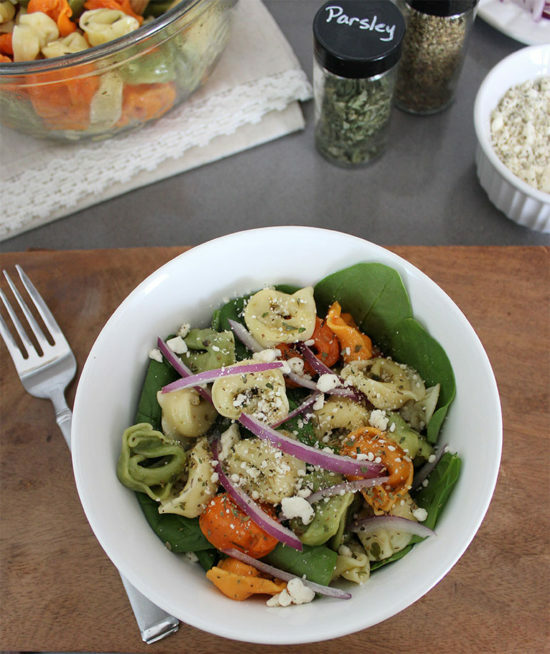 The tortellini and the dressing can be made the night before. On the day you want to serve it, all that you have to do is add the spinach, onion, and cheese. It’s really that easy. The recipe calls for a large amount of dressing with half is reserved on the side, but I’ve found that we never need that much. Now when I make this, I usually cut the dressing amount in half. I should note that I generally don’t like a ton of dressing on my salads. I got the recipe from my sister-in-law who brought it to a summer gathering a few years ago. I immediately asked for the recipe. Now when I bring it to parties, I get asked for the recipe all the time. When I find a recipe that my meat and potatoes husband likes as well as my vegetarian daughter, I know it’s a keeper! 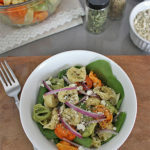 This tortellini salad is one of my go-to summer dishes, I hope you enjoy it as much as we do! You can also check out another family favorite, Bacon and Asparagus Pasta here. 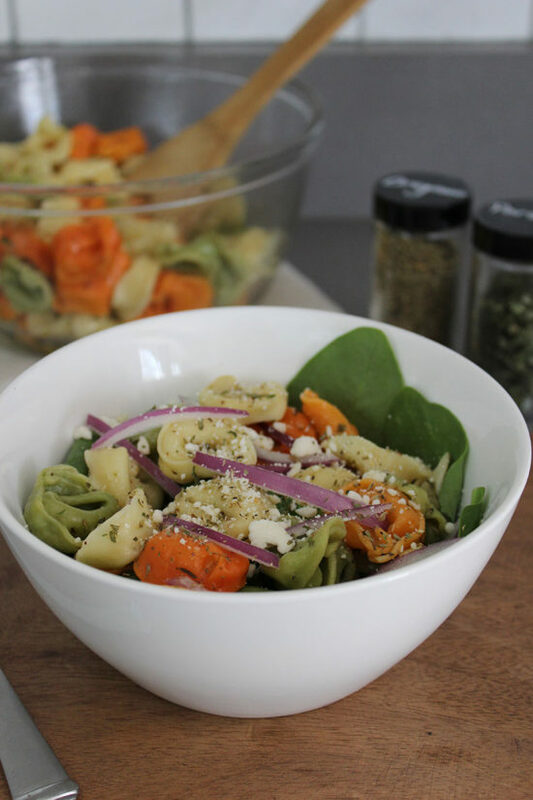 This simple tortellini salad is a crowd pleaser. It's easy to make, can be made the day before and only requires a few ingredients! Night before; cook tortellini according to package directions and drain. Mix well the olive oil, vinegar, lemon juice. oregano, parsley and salt. In a bowl, combine the tortellini and half the dressing, mix well. Cover and refrigerate overnight. 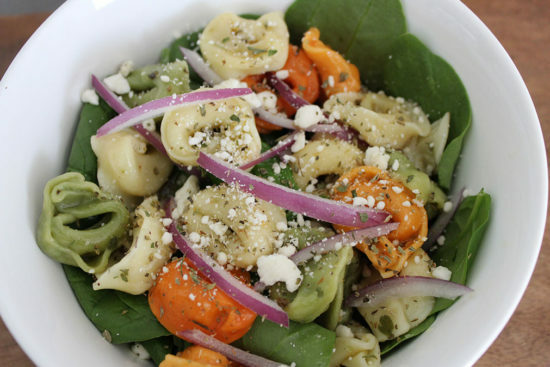 Day of; Add the arugula, chopped onion, and feta cheese to the tortellini mix. Serve with remaining dressing on the side.